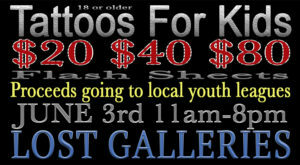 Were doing tattoo flash all day this June 3rd. Make sure you all come out and get something cool so we can donate the proceeds to local youth sports leagues. This is an 18 and up event with id required. We’ll be doing first come first serve with a limit of 3 tattoos. Follow our Facebook page for pictures of the flash before the event. www.facebook.com/lostgalleries.